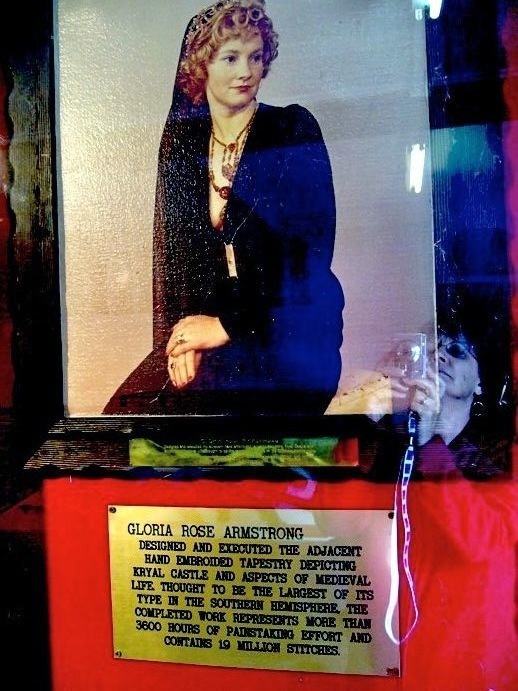 An image of a portrait of Gloria Rose Armstrong who designed and executed the hand embroidered 'Kyral Tapestry', which is displayed at Kryal Castle, a tourist attraction located 8km from Ballarat in Victoria. The tapestry depicts Kryal Castle and various aspects of medieval life. Reportedly the largest of its type in the Southern hemisphere, the Kryal tapestry took 3600 hours to complete and is thought to contain 19 million stitches. 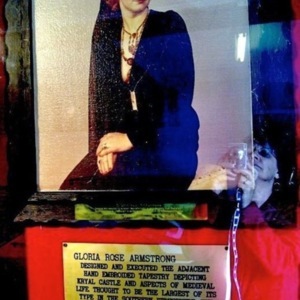 “Portrait of Gloria Rose Armstrong, Kryal Castle,” Medievalism in Australian Cultural Memory, accessed April 23, 2019, http://ausmed.arts.uwa.edu.au/items/show/1244.